Depending on the location of your birthmark, it may be more of an endearing trait that you never want to get rid of than a nuisance. If, however, you have a birthmark in a location that’s more visible, you may jump higher than you ever imagined at the thought of having it removed. With so many methods online that claim to get rid of birthmarks, it can be hard to know what will work and what is a myth. This article will analyze three different birthmark removal tips and whether or not they work or they’re a bust. Read on to learn more. Lemons are high in acidity, making them great for things like naturally whitening your teeth. However, when it comes to lightening your skin and getting rid of your birthmark, they aren’t going to do anything but make you smell like a fresh glass of lemonade. So, the next time you read about rubbing lemon on your birthmark to get rid of it, save it for a drink instead. Olive oil is one of the healthiest oils to cook with, but it can also be good to use topically. Containing moisturizing capabilities, if used on your skin, hair, or nail beds, it can make you feel revitalized. However, just because it’s moisturizing, it doesn’t mean that olive oil will be able to get rid of your birthmark. Rather than wasting olive oil by using it to get rid of your birthmark, try using it as a moisturizer instead. 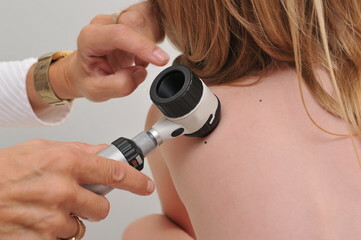 The only real way to get rid of your birthmark is through laser treatments from Chevy Chase Dermatology. Your birthmark is in the subcutaneous part of your skin— the bottom layer— which means that it needs advanced technology to get that deep. By heating up your skin, laser technology will work to target the pigment and lighten it after several treatments. If you have a birthmark that you wish you got rid of on the day you were born, contact Chevy Chase Dermatology to set up a consultation. During your consultation, we will evaluate you to determine whether or not you are a good candidate for a laser treatment. © 2019 Chevy Chase Dermatology, LLC All Rights Reserved.